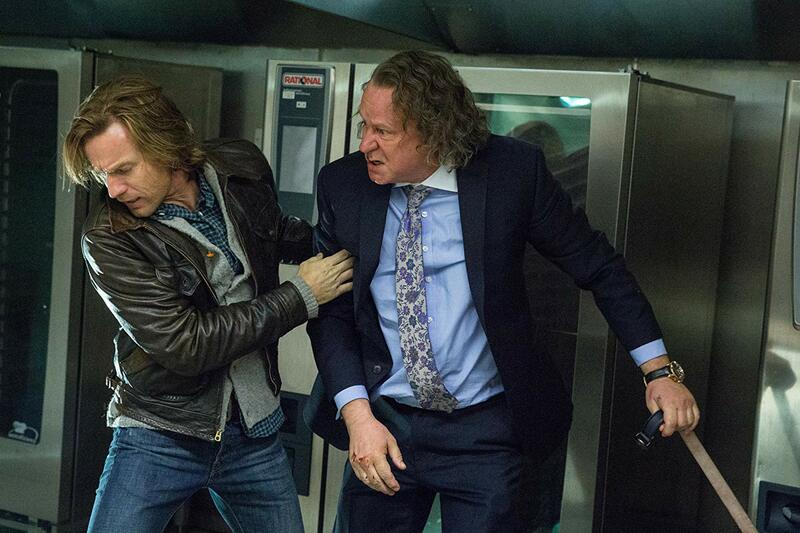 A low-key spy thriller, Our Kind Of Traitor features a mildly interesting story but never fully engages. Englishman and teacher of poetry Perry MacKendrick (Ewan McGregor) and his wife Gail (Naomie Harris) are on Morocco on vacation, trying to patch up their marriage. A burly Russian calling himself Dima (Stellan Skarsgård) insists on buying Perry drinks, invites him to a party, and arranges a friendly tennis game the next morning. Dima introduces Perry and Gail to his extended family and invites them to another party, where he confides in Perry that he is the chief money launderer for the Russian mafia, and a changing of the guard means that Dima and his family are in grave danger. Dima wants Perry to connect him to British Intelligence services, offering information about corrupt high-level British government officials in exchange for asylum for his family. Back in London Perry does connect with Hector (Damian Lewis) of the MI6. Under-resourced and lacking support from his superiors, Hector recruits Perry and Gail for a follow-up meeting with Dima in Paris, where Dima's enemies start to get suspicious about the tweedy Englishman hovering around their target. John le Carré book worked on the page, but this adaptation, directed by Susanna White and written by Hossein Amini, struggles to tease out cinematic anchors. The story features no central protagonist or theme other than the dense fog of corruption and careerism subsuming anything resembling morality. Despite good production values, dedicated performances, and a faithful tone, the film operates in a void that discourages caring. Perry and Gail are barely sketched-in, their background troubles only hinted at. Hector and his crew are all business. Dima's family are background characters with almost no lines of dialogue. The head of the mafia, a man known as the Prince, and all his goons, are one-dimensional evil monsters in three-piece suits. With Stellan Skarsgård in full-on effusive mode, only Dima comes across as a halfway interesting character, and the curious bond he forges with Perry is the closest White gets to creating a heart for the film. But even here there is trouble: it is difficult to imagine a man with Dima's resources, wealth and connections having to rely on a random encounter with an Englishman to forge his family's escape plan. And Perry's justifications for allowing himself to get sucked into the orbit of an admitted master criminal and killer are only half-convincing. At least Our Kind Of Traitor attempts to be cerebral, with dialogue, plotting and low-levels of unease and tension deployed instead of mindless action. But the message of pessimistic doom loses its bite in the absence of hopeful souls willing to endure the suffering.